Unterschiedliche Haltebedingen - Unterschiedliche Klauenklötze. Nach den heutigen Entwicklung der Klauenpflege ist der Klauenklotz in modernen Milchviehhaltung nicht mehr wegzudenken. Noch bevor die Klauenpflege nach heutigem Standard durchgeführt wurde, hat man Lahmheiten bei Kühen und Rindern oftmals durch anbringen eines Klotzes behandelt. Um den richtigen Klotz zu wählen sollten Sie die Bedingungen von Stallboden und die Orthopädie der Klaue genau analysieren. Unabhängig aus welchem Material dieser besteht, ist dieser dazu entwickelt worden um erkrankte Klauen zu entlasten um den Heilungsprozess zu fördern. Hier finden Sie einen Überblick über die Vorteile der unterschiedlichen Materialien. INFO - Der Walkease Klauenklotz wird mit extrem schnell aushärtendem Spezialkleber verklebt. Das Anbringen erfordert Erfahrung und präzises arbeiten. Durch das flexible Material hat es den Vorteil das diese EVA-Klötze sehr selten in der Güllepumpe feststecken. The modern hoof care has caused many changes in the way of treating illnesses and diseases on the hoof of dairy cows and cattle. Wooden or rubber hoof blocks are applied to the cows' hoof to support the healing process of affected claws. With the help of specially developed, fast curing REDO-BOND Hoof Block Adhesive it is adhered to the healthy side of the hoof which quickly reduces pain and thereby supports the healing process of the lame claw significantly. 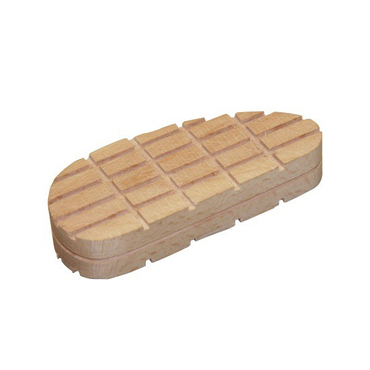 Wooden hoof blocks are commonly used in the treatment of toe, heel and sole ulcer-derived lameness. Traditionally, an epoxy glue is used to adhere a wooden block to the sound claw, relieving the lame claw from bearing weight, providing time to heal. While this is a highly effective method of treatment, we need a glue with a lower setting temperature. A standard wooden hoof block often not sufficient anymore to bring relieve the affected side of the hoof. The actual conditions at the stable and the surroundings and the orthopaedics of the hoof need to be included in the process of choosing the right hoof block. Today we can offer 3 different materials, such as wood, rubber and eva. The soft eva blocks are specially recommended to treat hooves where defects are still in the early stages and where a 2-3 weeks of relieve to the affected hoof are sufficient for the healing process. In addition these claw blocks can used on thin or aching soles where a wooden block could not be applied anymore. Although the last mentioned material has increased in popularity the standard hoof block in wood and 110 or 112 mm length is still the most popular hoof block used in Europe. 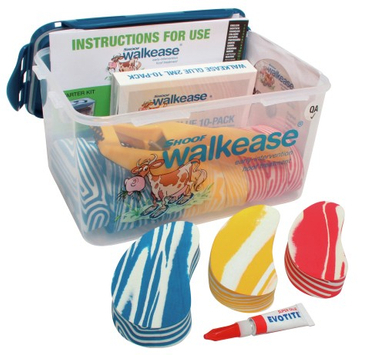 However we offer the wooden blocks in 5 shapes and sizes, the rubber blocks in one standard size and the eva blocks in 4 different shapes and sizes.